You are here: Home / events / Spring 2015 -Celebrating 25 Years!!! On March 24th we held our Annual General Meeting and celebrated Doorstep’s 25th Anniversary. 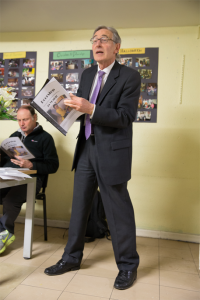 Our guest speaker was Councillor Julian Fulbrook ( Chair of Canden’s Housing Committee and Cabinet Member for housing. The event was well attended by our srvice users and supporters in the community. Our Parliamentary Candidate for Labour, Tulip Siddiq also joined us. April 7th- We will be providing a programme of activities for approximately 35 children, 0-14 years during the two week Easter Holidays. St Mary’s School, Sarum Hall School and Teacher Stern Solicitors are all organising events to help Doorstep raise funds. 60 children attended our Summer Programme of activities from last week in July and through August. Cooking, arts, crafts, science, sports, games and trips out. Tapestry Films gave their expertise, for free, to create a film for our upcoming newly designed website. Teacher Stern Solicitors raised funds and bought our kids a trampoline for the garden. They are continuing to raise funds to help us. St Mary’s School raised £500 and Sarum Hall School raised £2,000 for us. Volunteers from The American School in London are coming to tend our gardens on October 25th. JW3 and a couple of local businesses are going to be collecting food and hygiene items for our families as part of Mitzvah Day. Abercorn School are going to be holding events to raise money for us. Free Cakes for Kids Camden are baking individual birthday cakes for all our kids. We are compiling lists for the kids Christmas Gift Drive. Our sincere thanks to everyone for their help and support.